Serialization and mythology are two terms often used interchangeably to describe events in television despite meaning very different things. Breaking down the word “serialization” nets “serial” and the suffix “-ization”—the former is the type of story popularized by Charles Dickens and the original run of Doctor Who, while the latter indicates a process of transformation. (It’s a combination of “-ize” which is the process of making, rendering, or converting something into something else, and “-ation” which provides the noun form of the word, as opposed to a verb like “to serialize.”) Mythology evokes an entirely different set of images—that of Hercules, or kitsune, or creation stories. Mythology is a collection of stories that combine to form a belief system, a way of living that is greater than the sum of its parts. The limitations should stand out: serialization is bound by the events and characters that exist within the world of the story, while mythology can suggest something greater than the story. On the other hand, mythology can take any form (including serialized stories) which can often breed contradictions, logical paradoxes that can only be solved by human irrationality—which serialization necessarily limits as it conforms to a logical series of events. To put things simply (a bit too simply), serialization is how things happen, while mythology is why things happen. This may seem a bit highbrow, but it’s a necessary launching point for this week’s episodes. So Weird was the show with the darkest tone of any Disney Channel original series to that point, arguably in the entire history of the channel. It achieved that tone not only by grounding the monsters in adolescent woes (the classic Buffy approach) but also by not backing down from its core premise: a family in pain. Thus the necessity developed to begin constructing a world, a mythology that Fiona can interact with on a weekly basis. The show has some freedom in this case, given that Fi already pulls from multiple mythological sources to explain the paranormal phenomena she encounters at seemingly every tour stop. But in order to properly define what So Weird is truly about, it has to define the “family” part of that “family in pain” directive. This week’s episodes, “Angel” and “Strangeling,” both feature examples of serialization and mythology working together to help construct the overarching story of So Weird: the healing process of the Phillips family. “Angel” fumbles a bit on the serialization side, but is rescued by a strong finish; meanwhile, “Strangling” is possibly one of the most important episodes of the show to date, both as an early example of the show’s world-building efforts and as the beginning of the development of a show mythology. The reason “Angel” fumbles a bit on serialization isn’t made clear until the very end of the episode, but on reflection, the flaws stand out. Fi opens the episode talking about angels of both good and ill omen (old hat to anyone who’s read the Bible for the plot or seen the Eric Kripke-run years of Supernatural) but the episode doesn’t necessarily answer whether the apparition who runs the tour bus off the road in Ohio is a good angel or a bad one. It’s true that he shows Fiona the truth about farm girl Gabe Crawford at the end, but that doesn’t mean he wasn’t also hovering over Gabe, waiting for the right moment to carry her to the afterlife. The puzzle piece of the episode is the angel necklace Gabe wears in every scene. She touches it whenever someone mentions the apparition, but at the end, as she receives the bone marrow transplant from Fi, she gives Fi the necklace to give to Jack, who fell head-over-heels in love with Gabe on first sight. (This romance element is sorely underdeveloped as written, but the performances from Patrick Levis and Jane McGregor help carry it. Erik von Detten’s energy as he enthusiastically cheers on Jack/Gabe doesn’t hurt, either.) It’s only obvious in retrospect, when the necklace later becomes a Chekhov’s gun, but there’s something special about it besides being a connection to Fi’s opening narration about angels. Of course, it’s also just a symbol of Gabe’s love for Jack—the act of sacrificing for love is equally meaningful in the long run. But while Gabe’s necklace is evidence of serialization, “Angel” also packs in a bit of mythology for the show. To this point, Fi’s connection to her father via the paranormal has been understated, simply a way to show how and why Fi believes so strongly in the things she believes. But when she finds out that the Angel is looking for her, she begins a journey encapsulated in the episode by the arresting image of Fi and the Angel walking into a doorway of light. It’s a journey also captured by the show’s theme song: “Out of the shadows of my life/(in the darkness is the light…)” The show uses classic Enlightenment metaphors of darkness-as-ignorance and light-as-knowledge to show that Fi is not just a character who’s constructed a personal mythology in order to connect to the father she never had, she’s also a character on a journey to discover the truths of the world that people like Gabe and her father often wish would remain hidden. That’s a difficult concept to capture in purely serialized form: no series of events can really get at the kind of complex characterization that defines Fiona. This invocation of the dichotomies of life and death, of ignorance and knowledge, is ultimately what saves “Angel” from being simply a mediocre episode of the show. Meanwhile, “Strangeling” is an exercise in balancing mythology and serialization with the formulaic approach that is vital to most television series. The titular creature (apparently some distant cousin of the dragon) is once again minimized in favor of Fi opening a discussion about the existence and nature of magic. Similarly, the episode abandons the “Town of the Week” formula for a trip to visit a family member: Fi’s Aunt Melinda, Molly’s sister. Melinda is one of the witches in a production of Macbeth, which both accommodates the mythology (as Fi discovers that she’s descended from witches through the maternal bloodline) and provides an appropriately dark and creepy setting for the monster to hide in. The stage setting also leaks into the story. Fi’s cousins Miranda and Maggie, who are devout followers of Fi’s website, dress her up as a witch and tease her with stories of Melinda’s spellbook being real, while Jack and Clu dress up as knights and learn a few stagecraft tricks. Things get heated after a stage fight between Fi and Jack: Jack uses a trick to fall through the stage during a smoky haze, but Fi is play-acting by reading a spell from Melinda’s book—which is, as implied by Fi’s cousins, a real spellbook. It’s only after Fi gets mad at Jack (and belittles Maggie and Miranda for believing in silly things like magic) that she realizes what she’s done, and sets about trying to stop it. The summoning and banishing of the strangeling serves a very Buffy-esque purpose for Fi. Jack has already called her out for acting selfishly in the pursuit of the supernatural, but here, Fi actually does something she didn’t mean to, in service of having a good time with her older brother, and so she must now take responsibility for her actions and put the creature back into the book. The show lays no artificial barriers in her way. 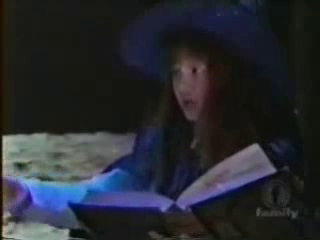 Instead, it empowers her to find a solution, which she does when she realizes that the book frightens the creature that sprang forth from its depths. It also gives her a chance to really have fun with Jack as he, dressed as a knight and wearing a helmet through which he can barely see, is directed by Fi into tricking the creature back into the spellbook. This empowering of Fi is captured beautifully by director Pat Williams, who wisely chooses to shoot Fi from below and Jack from above as she confronts him about his stagecraft trick. It’s film’s universal language for denoting power structures, and its usage here could not be more appropriate. The show firmly establishes its mythology in giving Fiona’s Celtic ancestors an identifiable name: the O’Shannons, which Molly tells Fi was Grandma Kathleen’s maiden name. But “Strangeling” also has a piece of serialization as well. After all, if the maternal side of Fi’s family has supernatural powers, why shouldn’t there be some sort of supernatural connection on the paternal side? “It’s funny that Fi’s into all that weird stuff, huh?” Melinda says to Molly… to which Molly reacts awkwardly: “You haven’t told her yet?” It seems Molly has been keeping a secret from Fi about her father: that he, too, was an investigator of the paranormal. This key reveal to the audience places the show’s implicit discussion of Fi’s journalistic curiosity about weird happenings into a new context. What other secrets have been kept from the Phillips family about their patriarch? Unfortunately, that’s not a question that can be answered in a half-hour installment. But both “Angel” and “Strangeling” are the episodes of a much more confident series, one that knows exactly the kind of story it wants to tell, if not necessarily how it wants to tell it. “Strangeling” is the stronger episode because, despite all the new developments regarding the Phillips family, it’s still an effectively atmospheric standalone about a monster that gets loose during a rehearsal of Macbeth. Artistic expression flourishes in the face of limitations; So Weird proves that by putting the limitations of serialization and mythology to good use. Cameron White is a freelance writer currently residing in Arkansas. He writes about television over on his blog, Wayward Television, and tweets about epic Breaking Bad moments. His obsession with television was founded in 1996 by The Disney Channel and fostered by his discovery of Firefly in the summer of 2007. He is pen pals with the Loch Ness Monster, but don’t tell anyone!